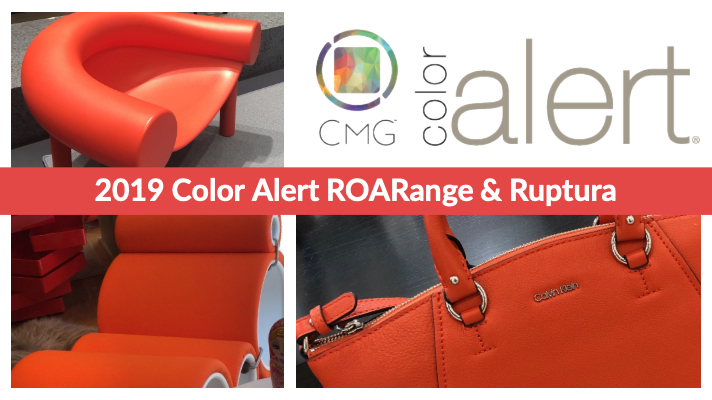 Color Marketing Group® (CMG) announces the forecasted 2019 April Color Alert ROARange and Ruptura, appearing now on the world stage. Take a stand and let your passion be known! Emanating from enthusiastic discussions in 2017, to emerge in 2019, two colors are tearing up the global reach of color. With identical core hues, ROARange and Ruptura, from North America and Latin America, respectively, differ only in their value of greyness. They share passion and determination as well as their yellow/red core. Experience and download the full April Color Alert® color forecast! Each month CMG highlights one of their 64 World Color Forecast™ colors. Color design professionals forecasted this color trend two years ago and today this forecasted color is appearing in global markets. Stay connected in color by signing up to receive our FREE monthly Color Alert® and bi-weekly newsletter, CMG Color Connection.